Is it Time to Phase out Traditional Analog CCTV Cameras for Solar IP Cameras? - VIA Technologies, Inc.
Home » VIA News » Is it Time to Phase out Traditional Analog CCTV Cameras for Solar IP Cameras? In recent years, we’ve seen a gradual emergence of ‘Smart’ products in our homes. These are usually household appliances that have been re-imagined and updated with the capacity to connect to the Internet. One example includes the arrival of Smart Security devices that offer enhanced connectivity and easier management, while also being more affordable. With these new and superior options on the market, is it time to replace functional, yet aging CCTV systems? Traditional analog Closed Circuit Television, or CCTV systems, have been employed to assist public safety in governmental and commercial buildings for several decades. We typically picture security operators in a control room staring at multiple screens, watching live feeds of a car park or building complex. Those days are soon to be a thing of the past, thanks to huge advances in communications technology. There is also the issue of accessibility to think about. What was once considered to be an expensive solution, exclusive to large entities such as governments and businesses, is now readily available and significantly more affordable for the average consumer. The primary function for CCTV has always been to monitor and surveil specific parts of a building or property but they have also been very useful in providing video evidence when needed. When a store, factory or warehouse is burgled, video evidence is crucial in helping to identify and ultimately, convict criminals. Indeed, the presence of a security camera can be a sufficient deterrent against potential crimes or mischief. These are key reasons for everyday consumers to consider using security surveillance products in their homes. The VPai Solar IP Camera is a great example of a modern take on traditional CCTV. It incorporates a powerful full HD resolution camera teamed with a solar panel that allows it to operate using only the sun’s energy. It’s also equipped with Wi-Fi connectivity, allowing users to interact with the camera and its footage remotely, via any iOS or Android device. Unlike CCTV systems, IP cameras do not require cables to carry data or video feeds, making installation and deployment far easier. Solar energy support also eliminates the need for power cables – which makes the device entirely cable-free and perfect for geographically challenged locations where a local power source may not be available. Finally, let’s not forget that being cable-free has the innate security advantage of being immune from any attempted ‘cable cutting’. As well as helping to eliminate cables, IP cameras that use solar power can reducing electricity bills, while also contributing to a lower carbon footprint. But what about times when there is little or no sunlight? The VPai Solar IP Camera integrates rechargeable battery cells that are are topped up during the daytime and used to maintain operation at night and on low light days. All of which means Solar powered IP cameras are uniquely suited to providing stable and reliable operation over long deployment periods. Wire-free, IP security cameras offer enhanced flexibility when it comes to deployment. This makes it far easier to scale a security infrastructure up or down as required. By eliminating the messy task of routing power and data feed cables securely throughout a location, adding an additional camera to your security system involves a straight forward installation process. Add the new camera to the Wi-Fi network, and you’re done. It really is that simple. Once an IP cameras has been integrated with an existing Wi-Fi network it can then be accessed and controlled via an app installed on a standard Android or iOS device. Having access to live video feeds and recorded footage reduces the need for constant supervision, a major boon for those of us who need to monitor a particular area whilst not physically present. Although IP cameras are fitted with local storage to record video stream footage (SD cards being the most commonly used), the emergence of cloud networking means that recorded footage can be accessed anywhere, anytime. The option to have both local (SD card) and cloud storage guarantees that everything is backed up in the case of network interference or failure. Many modern products like the VPai Smart Solar IP Camera are also fitted with motion detection sensors which instantly detect movement in the vicinity. Once motion is detected, the camera can sent alerts along with a stream of the related video footage – all sent directly to your smartphone. Motion detection can also allow the camera to remain in standby mode until the system detects movement. Most modern IP cameras today support Full HD image processing, providing crisp and clear image and video footage. 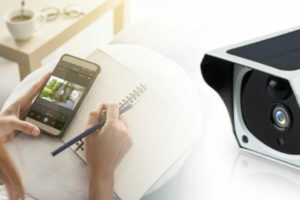 This is a significant step up from traditional CCTV systems that produced VGA resolution footage at 640 x 480 pixels with images that were typically blurry and pixelated in comparison to modern products that shoot in vastly larger 1920 x 1080p resolution. To be able to provide reliable round-the -clock monitoring, many IP cameras also feature night vision to provide an effective solution during low visibility hours. Infrared LEDs are combined with a light sensor help give users peace of mind while sleeping, with continuous surveillance throughout the night. The traditional CCTV system has clearly evolved into a new breed of IP camera that not only appeals to large enterprise customers and businesses, but also for home owners and regular consumers. This new era of smart security provides the ability to control and monitor property with ease, while also offering a more evolved and intuitive way of interacting with the camera and the footage it produces. Adding solar power to the mix means they are now self-sufficient, cable-free and far easier to install – several reasons to believe products like the Solar IP Camera are poised to replace traditional CCTV infrastructure around the world. Written by Charlie Tang, Intern at VIA Technologies, Inc.